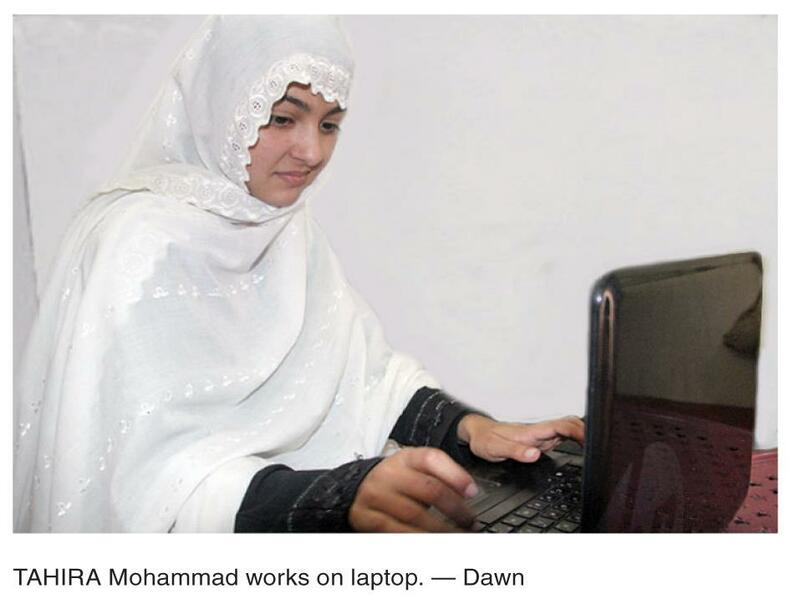 MINGORA: Orphaned at the age of one year and looked after by her mother, a domestic worker, 17-year-old Tahira Mohammad hasbecome the first female IT expert in Swat. She wants to become a software engineer and leads her own firm, however, financial hurdles have made realIsation of her dream difficult. `I have not seen my father as he died when I was one year old. Since then, my mother reared me working as cleaner and performing other domestic chores in the houses of rich people,` Tahira told Dawn. She has no siblings and lives with her mother in a one-room rented house. She said that since her childhood she used to go with her mother to different houses and see children playing and working on computer. `When I saw other children playing on computers, I started taking interest in computer and my interest developed into a pas-sion,` said Tahira. Her mother wanted her to get education and admitted her to a nearby government school. However, her mother fell ill and was unable to work full day but she was in 9th grade. `My life became hard and I passed matriculation examinations with difficulties. After that I started teaching in a private school in our neighbourhood to help my mother,` she said, adding that she got admission in one-year diploma in Information Technology and suc-cessfully completed it. Although Tahira wanted to get computer education yet her mother wanted her to become a doctor so she got admission in FSC pre-medical. Going to computer institute to complete her diploma was also an uphill task as people in her neighbourhood considered it inappropriate for a girl to go to a college for boys. `People spoke ill of me and boys used to taunt me but nothing discouraged me. In the morning I am teaching at a private school and in the af ternoon I go to PPC College to continue my studies. I got admission in pre-medical for sake of my mother but now she understands my feelings and has allowed me to change my subjects to computer science,` she said. However, Tahira cannot afford to be admitted to a standard college of computer science as her monthly salary is Rs4,000, which she spends at home. One of the house owners, where her mother works, gave her a laptop. She uses the laptop for software programming. She loves to design software and, so far, she has made a software porgramme for birth registration. She is also working on her own website to collect data on violence against women. `There will be software on my website where people from everywhere will be able to add information regarding violence against women. I am also working on a software game to promote women rights,` she claimed. Tahira said that her dream of becoming a software engineer would be become true if provincial or federal government helped her to get admission in a standard computer science college. She said that she wanted to become a role model for girls of poor families. `I want to encourage and motivate girls, particularly from the poor families to show them that they can do and achieve their aims if they try,` she added.